A Chalmers-led team of astronomers have used the Alma telescope to make the surprising discovery of a jet of cool, dense gas in the centre of a galaxy located 70 million light years from Earth. The jet, with its unusual, swirling structure, gives new clues to a long-standing astronomical mystery – how supermassive black holes grow. 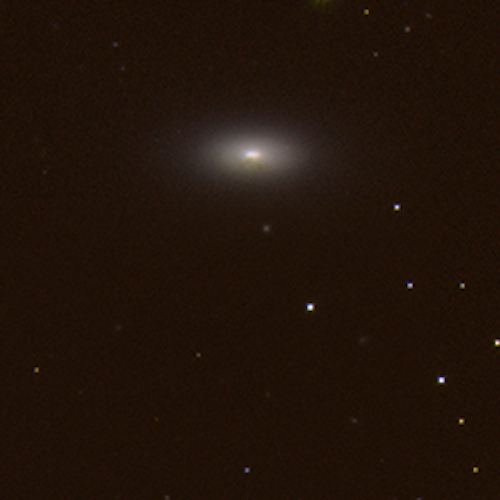 A team of astronomers led by Susanne Aalto, professor of radio astronomy at Chalmers, has used the Alma telescope (Atacama Large Millimeter/submillimeter Array) to observe a remarkable structure in the centre of the galaxy NGC 1377, located 70 million light years from Earth in the constellation Eridanus (the River). The results are presented in a paper published in the June 2016 issue of the journal Astronomy and Astrophysics. “We were curious about this galaxy because of its bright, dust-enshrouded centre. What we weren’t expecting was this: a long, narrow jet streaming out from the galaxy nucleus”, says Susanne Aalto. The observations with Alma reveal a jet which is 500 light years long and less than 60 light years across, travelling at speeds of at least 800 000 kilometres per hour (500 000 miles per hour). Most galaxies have a supermassive black hole in their centres; these black holes can have masses of between a few million to a billion solar masses. How they grew to be so massive is a long-standing mystery for scientists. The discovery of the remarkable cool, swirling jet from the centre of this galaxy would have been impossible without Alma, concludes Susanne Aalto. “Alma’s unique ability to detect and measure cold gas is revolutionising our understanding of galaxies and their central black holes. In NGC 1377 we’re witnessing a transient stage in a galaxy’s evolution which will help us understand the most rapid and important growth phases of supermassive black holes, and the life cycle of galaxies in the universe”, she says. 2. Alma’s close-up view of the centre of galaxy NGC 1377 reveals a swirling jet. 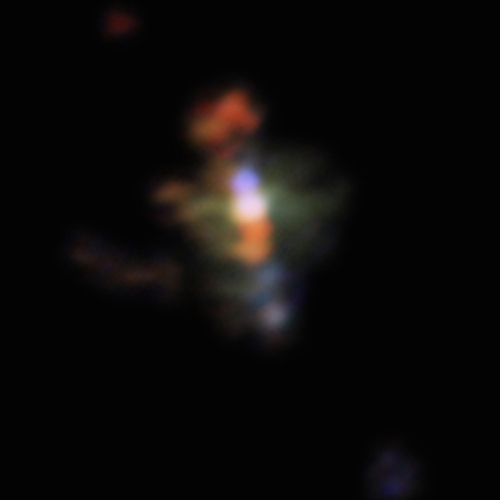 In this colour-coded image, reddish gas clouds are moving away from us, bluish clouds towards us, relative to the galaxy’s centre. The image shows light with wavelength around one millimetre from molecules of carbon monoxide (CO). 3. 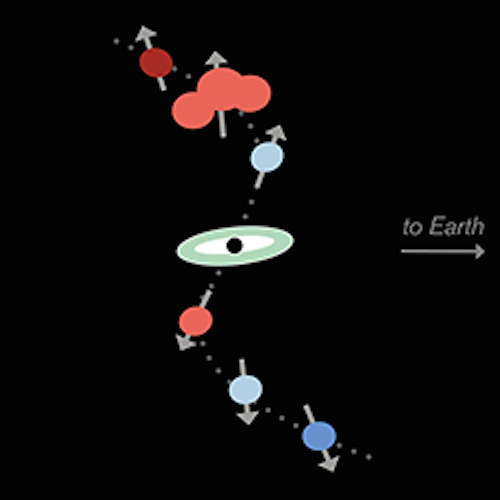 This cartoon view shows how the clouds of material that make up the jet are moving outward from the central black hole, this time seen from the side. Red colours show clouds that are moving away from us, and blue colours show clouds that are moving towards us, relative to the black hole in the galaxy’s centre. This research is presented in the article A precessing molecular jet signaling an obscured, growing supermassive black hole in NGC 1377?, published in the June 2016 issue of Astronomy and Astrophysics (http://dx.doi.org/10.1051/0004-6361/201527664). The team is composed of Susanne Aalto (Chalmers), Francesco Costagliola (Chalmers and ORA-INAF, Italy), Sebastien Muller (Chalmers), K, Sakamoto (Institute of Astronomy and Astrophysics, Academia Sinica, Taipei, Taiwan), Jay S. Gallagher (Department of Astronomy, University of Wisconsin-Madison), K. Dasyra (National and Kapodistrian​ University of Athens, Greece), K. Wada (Kagoshima University, Japan), F. Combes (Paris Observatory, France), S. Garcia-Burillo (Observatorio Astronomico Nacional (OAN)-Observatorio de Madrid, Spain), L. E. Kristensen (Harvard-Smithsonian Center for Astrophysics, USA), S. Martin (European Southern Observatory, Joint Alma Observatory and IRAM, France), P. van der Werf (Leiden Observatory, Netherlands), A. S. Evans (University of Virginia and Virginia and National Radio Astronomy Observatory, USA) and J. Kotilainen (Finnish Centre for Astronomy with ESO (FINCA), University of Turku, Finland). Alma (Atacama Large Millimeter/submillimeter Array) — with its 66 gigantic 12-metre and 7-metre antennas - is an international astronomy facility located at 5000 metres altitude at Chajnantor in northern Chile. Chalmers and Onsala Space Observatory have been involved in Alma since its inception; receivers for the telescope are one of many contributions. Onsala Space Observatory is host to the Nordic Alma Regional Centre, which provides technical expertise to the Alma project and supports astronomers in the Nordic countries in using Alma.